A paraglider became entangled with some power lines Tuesday morning, injuring the pilot. 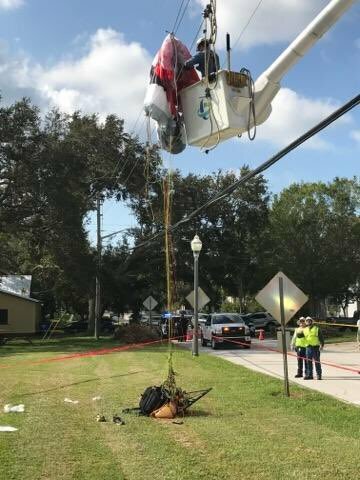 According to St. Pete Fire Rescue, the person was trying to land or takeoff but got tangled up in the power lines. As of now, the parachute is still tangled and the power company is on scene. St. Petersburg Fire & Rescue said the pilot told them he was having engine trouble, and tried to make an emergency landing at Bear Creek Park. But instead he missed the fields and hit those lines that each carrying 7200 volts of electricity. 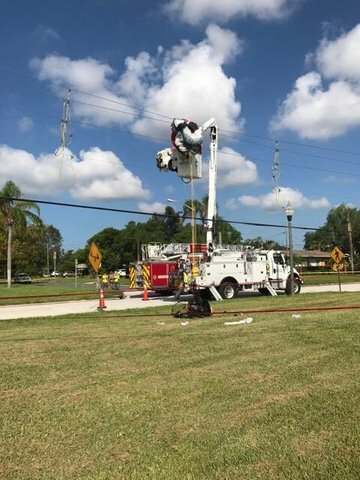 “If you come in contact with multiple ones you are almost doubling the voltage that has the potential to go through your body,” said St. Petersburg Fire & Rescue Deputy Marshall Steven Lawrence. People here said they’ve seen paragliders using the park as a take off and landing spot for days. And some told us they just don’t think it’s safe. “You could start a house on fire, he could kill himself. He could hurt somebody on the ground. There is a child’s playground right down there,” said Tallon. While we were there, another man picked up what was left of the paraglider and put in a truck along with the pilot’s helmet and shoes. Investigators haven’t told us who crashed other than to say he is a firefighter. He is hospitalized with electrical burns. Nearly 40 homes lost power for a while until a Duke Energy crew eventually removed the parachute from the lines. St. Pete Police said the pilot did not violate any laws. Paragliders are allowed to take off and land wherever they want, provided they don't enter restricted air space. It happened in the area of 5901 1st Ave. N in St. Pete.